We’ve been working through chapter 6 of Johns Gospel. On the 17thSunday we spoke about God providing manna as nourishment for the Jews as they journeyed from Egypt to Jerusalem and how God has now replaced the manna, the type of journey, and the destination. Jesus is the true bread from heaven that nourishes us on our spiritual journey to heaven. And to offer proof that the Eucharist alone is life-sustaining food we shared the story of Alexandrina who began an absolute fast living on the Eucharist alone for 13yrs. Last week we talked about honing our desires so we hunger for Jesus hidden in the Eucharist, the true bread from heaven and food for our souls. This involves ongoing conversion and much prayer. This week we pick up on the theme of living bread and how that bread is his flesh given for the life of the world. This anticipates the Eucharist. As the Eucharist involves the miracle of transubstantiation, I will reflect on a well-known sign that attests to its authenticity. One day in the eighth century, a monk was celebrating Holy Mass with a host of unleavened bread. The monk started doubting the real and substantial presence of the Flesh and Blood of Our Lord Jesus Christ in the consecrated Holy Species. After having pronounced the words of Consecration (“This is My Body... This is My Blood”), as Jesus had taught it to His Apostles, the monk saw the host change into a living piece of Flesh, and the wine change into real blood, which coagulated and split into five globules. The Host-Flesh, as can be very distinctly observed today, has the same dimensions as the large host used today in the Latin church; it is light brown and appears rose-coloured when lighted from the back. The Blood is coagulated and has an earthy colour resembling the yellow of ochre. The Flesh and the Blood have the same blood-type: AB (The blood-type identical to that which Prof. Baima Bollone uncovered in the Holy Shroud of Turin). In the Blood there were found proteins in the same normal proportions (percentage-wise) as are found in the sero-proteic make-up of fresh normal blood. As Jesus said “I shall give my flesh for the life of the world” referring to the Eucharist we’re about to receive. 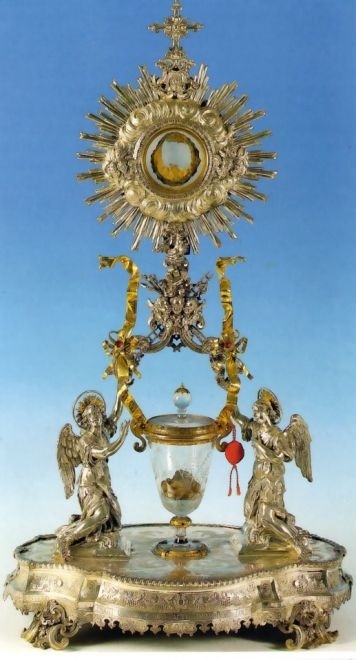 The reliquary: the Flesh is enclosed in a round gold-plated silver lunette, between two crystals, in a monstrance of finely sculpted silver. The Blood is preserved in a chalice of crystal and affixed to the base of the monstrance.